Before moving to the Central Coast in 1996 I maintained an active holistic health care practice in Los Angeles and Santa Barbara. My passion since 1986 has been teaching clients to create optimal health and well being through understanding how to balance food choices with lifestyle, in conjunction with simple self care natural healing methods. In 1992 after many of my clients in their 40's asked for natural options to slow the aging process, I embarked on what turned into a 19 year course of study and experimentation to find effective solutions. This journey evolved into a "how to/ self help" work book, "Ageless Beauty From The Inside Out", which is based on my simple 10 step plan to create ageless beauty and a method I call "natural facial rejuvenation", which I offer in addition to personalized weight loss and wellness services. The method I call "natural facial rejuvenation" draws upon more than 28 years of study in the traditional Asian healing arts, holistic nutrition and western healing modalities that is synthesized into a user friendly, flexible format that can be easily incorporated into any lifestyle and budget. The photo you see at the top of the page is of me taken in early 2016 at age 65 in natural light in our backyard. I have never had any cosmetic enhancements, surgical or otherwise and have enjoyed a very active life outdoors. 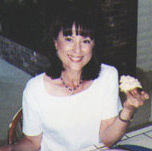 What you see is the result of following the plan outlined in "Ageless Beauty From The Inside Out". OPTION 1 is great for self starters on a budget who are good at learning on their own. Either a PDF version of "Ageless Beauty From The Inside Out " available through my website (see link below) OR a paperback version available from Amazon Books . A new or used paperback copy of "The Touch Of Healing" by Alice Burmeister from Amazon Books OR Jin Shin Jyutsu "Self Help Book 1" by Mary Burmeister available through Jin Shin Jyutsu, Inc. in Scottsdale, Az. (480) 998-9331. Please contact me if you buy "The Touch Of Healing" and I will email you the page numbers for the foundation routines. A PDF of the "Ageless Beauty At Your Fingertips" trouble spot routines booklet available through me for $3.00 , which I email to you once I receive payment. OPTION 2 is a flexible approach where you buy the above books and have me coach you on whatever you need help with or answer any questions. I charge $40.00 per 1/2 hour/$80.00 per hour for phone, Skype or video Skype sessions. OPTION 3... is a personalized program where you buy all the above books and make appointments for 3-4 sessions. I personalize the food plan, supplements, natural skin care products, and acupressure for the face to fit your needs and budget at $40.00 per 1/2 hour/$80.00 per hour either in person, by phone, Skype or video Skype sessions. Beautiful skin and a youthful appearance start from within. It is simply a reflection of your overall state of health, mirroring the harmony of body, mind and spirit. This book is offered as a simple 10 step guide to help you to create and integrate a holistic approach to natural facial rejuvenation and optimal wellness that works over the long haul. The "10 Steps" will give you the tools to look at all aspects of your life as a whole in order to make effective, lifelong changes. You will learn to create your own flexible anti-aging diet and exercise plan with easy to use guidelines, how to choose natural skin care products & supplements that work, as well as recommendations for a daily self care natural rejuvenation routine that can be done in minutes. Included are tips to improve sleep, increase your energy, and reduce stress that will help to turn back the clock and slow the aging process naturally. 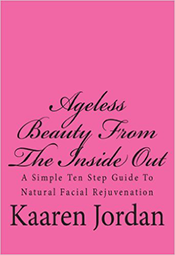 You can order ""Ageless Beauty From the Inside Out" ..a simple 10 step guide to natural facial rejuvenation" eBook for $12.95 via PayPal account or credit card by simply clicking on the Paypal link below. You will then be taken directly to the secure PayPal site where you can either pay with a credit card or from your PayPal account. The whole transaction takes place in the PayPal system which keeps your identity and account information secure and secret. Our account, which you will see appear automatically on the PayPal webpages, is info@kaarenjordan.com. Once you are finished it is also a good idea to confirm the receipt of your payment to insure you receive your e-book copy quickly. Please email us at info@kaarenjordan.com and we'll respond as soon as possible. And of course, thank you for your order! 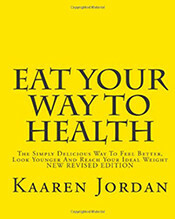 Or you can also order Ageless Beauty From The Inside Out eBook by regular mail. Just send us a check or money order for $12.95 made out to Kaaren Jordan, along with your email address and we will email you the Ebook as soon as we receive the payment. When you receive the email look for it as an attachment entitled agelessbeauty.pdf. If you click on the file you should see options to save and or open it. We suggest that you save the file to your hard drive first and then open it. It is a PDF file and can be read by a number of programs. Most computers come with programs already installed that will read PDF files. If your computer does not have a program that will do this then you can click on this link and download a free copy of the Adobe PDF Reader. Kaaren offers personalized consultations by phone, audio & video skype as well as in person classes and sessions.